At the mouth of the Hudson River, is the largest city in the United States and one of the most important and exciting cities in the world. According to legend, Peter Minuet purchased the island of Manhattan for $28 worth of beads and trinkets. The settlement was claimed in 1664 by Great Britain and after the Revolutionary War by the United States, eventually becoming the capital of the country. By the turn of the 19th century, New York Stock Exchange was founded and the city overtook Philadelphia as the most populous city in the country. The development of railroads and the Erie Canal made New York the natural gateway to the Midwest, bringing additional prosperity and growth. By the turn of the 20th century, the city expanded to include all five boroughs: Manhattan, Brooklyn, Bronx, Queens and Staten Island. 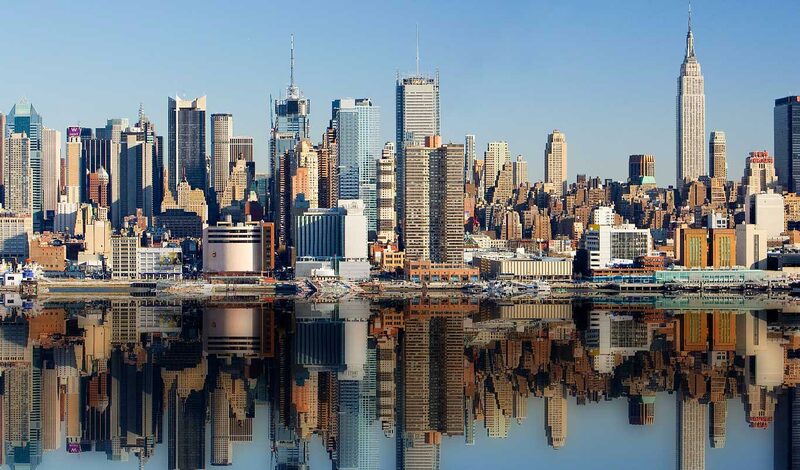 Today, the "Big Apple" has over 8,000,000 residents and more than 22 million in a huge metropolitan area that stretches to Long Island and across the New Jersey and Connecticut borders. The city is headquarters for some of the world's largest corporations and is a world leader in finance, with the stock exchange based there. New York is a center for advertising, fashion, entertainment, publishing and communications. New York is also home of the United Nations. Its port is the largest on the Eastern Seaboard. Its buildings are among the tallest and most famous in the world. Long known as a "melting pot" for its ethnic diversity, New York has communities representing almost every nation imaginable. Any city nicknamed "the city that never sleeps" has to have an energetic nightlife and New York more than lives up to that reputation. From SoHo to Broadway to Times Square to Harlem, live music and other entertainment are virtually without limit. All over the city are Irish bars, sports bars, dance clubs, drinking halls, pool halls, and jazz and blues clubs. Whether it's a hotdog for less than a dollar, a $100 meal from the latest celebrity chef or an authentic ethnic meal from a country you've never heard of, you can find it in New York. If you're interested in New York, please email your resum� with an introductory letter to to Dayna Lynn at dlynn@fsgltd.com or fill out the form below.